This fabulous apartment has panoramic views of Mandalya Bay from every room. The main balcony is the perfect place for watching the beautiful sunsets over the bay. Our guests love it and many come back each year. Gulluk is a quiet fishing village and popular resort. It is a short fifteen minute drive or taxi ride from Bodrum International Airport. The Bodrum Peninsula is described by the Sunday Times as the Mediterranean's hottest spot and Gulluk is on its north shore, a few miles from Turkbuku and Yalikavak, which are where Turkey's rich and famous take their vacations. Seaside Park is an exclusive development of only eighteen apartments in two three-storey blocks. They are set in their own private grounds with a fabulous "infinity" communal swimming pool and a smaller paddling pool for children (available from April through to October). The pool has a number of sun recliners for the less energetic! It is also covered by the wi-fi for those who want to surf. Although we advise a hire car, many of our guests have great holidays without one. Taxis from the airport are not expensive and EasyJet, Thomas Cook, Thomson, Jet 2 and many others operate direct flights to Bodrum from March to October. This beautifully appointed, spacious penthouse apartment, A-8, is the centre one of just three on the top floor of Block A and is furnished to a high specification. The apartment is large at 105 square metres and has tremendous panoramic views of Mandalya Bay from all three balconies, with the living room balcony being large enough for al-fresco dining. The large living room has two comfortable settees (one of which converts into a full size double bed), wi-fi and satellite television in the sitting area, as well as a full sized dining table and six chairs in the dining area. The kitchen area is fully equipped with everything you will need for a perfect holiday, including a dishwasher, hob, microwave and fridge. The main balcony off the living room has patio furniture and is large enough for al-fresco dining. There are even sun-lounger covers for using beside the pool. Both bedrooms are spacious and have their own balconies. Each bedroom has twin beds which can be pushed together to form a super-kingsize double or set as twin single beds. The main bedroom has an en-suite shower-room whilst the second bedroom has a separate shower-room beside it, which also contains a washing machine. Please note that we advise against young children because the balconies and stairs have some horizontal bars which would allow climbing. Also, although there is a toddler pool, the main pool is 1.7 metres deep throughout. We fell in love with the views and spaciousness of the apartments when we first saw the location and plans. We were not wrong. It has turned out to be one of the most desirable and exclusive developments in Gulluk. 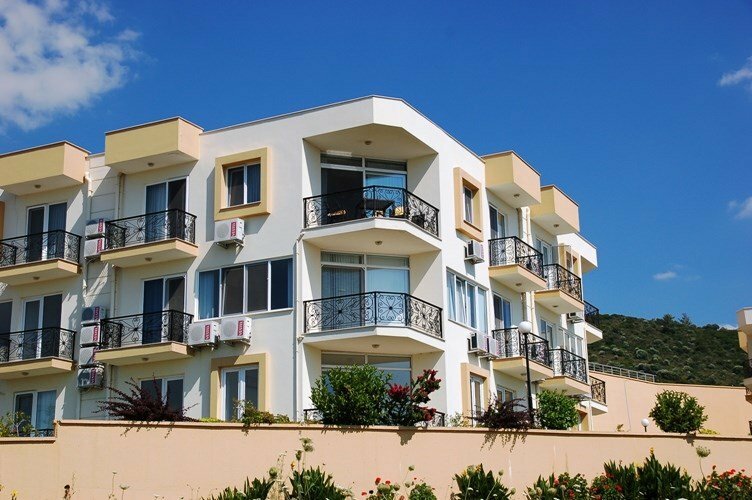 We loved it so much that our family purchased several apartments, which we use both for the family and as holiday homes. A hire car is not essential because the dolmus minibus service runs regularly along the coast road close to the apartment throughout the season. We would recommend a hire car if you want to visit Bodrum or play golf. If you want to hire a car, then there is plenty of space to park it. Apart from enjoying the sun, views, pool, gardens, beach and peace, you will want to enjoy some of the excellent fresh fish and food served in Gulluk. We have so far never been disappointed with the quality and taste of the fresh fish! There is a shop just 200 metres from the apartment and a bar/restaurant in the Greenhill development within easy walking distance. The new yacht marina has recently opened, which we expect will provide additional facilities in 2017. You will also want to visit Bodrum to enjoy the great cosmopolitan flavours of this great resort town. It has history, shops, restaurants, bars and nightlife. You may want to play golf at the great course at Vita Park nearby and you may also want to visit some of the historic sights such as Iassos. For family entertainment, you could send a day in Gumbet which has water parks through to banana boats. Alternatively you could visit the beach clubs in Turkbuku or Yalikavak. The choice is yours! The apartment has been furnished and equipped to a high standard to meet the requirements of a family looking for a relaxing, quiet holiday.